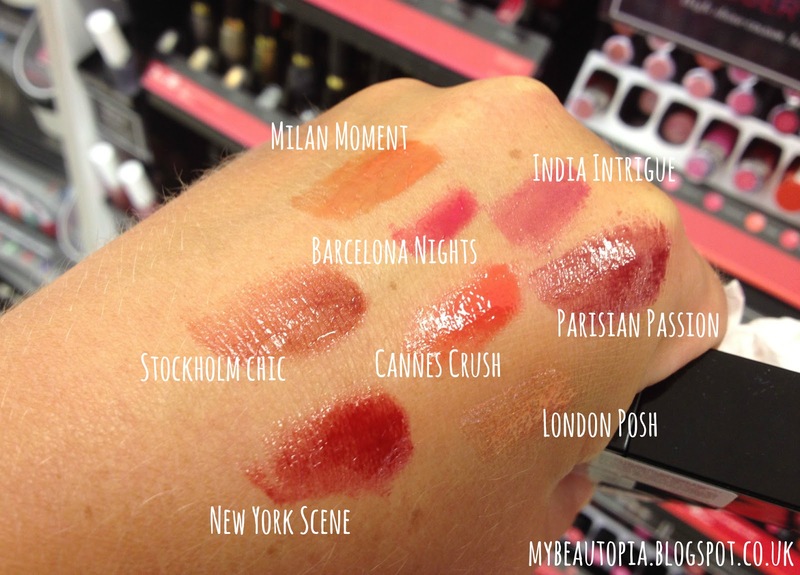 Out of the swatches above I bought 4 shades: Stockholm Chic (a rusty brown), Cannes Crush (coral-peach), Parisian Passion (vampy deep berry) and Milan Moment (peach). I didn't buy Barcelona Nights (too bright and cool-toned for me), New York Scene (tempting - but I never seem to wear red lipstick), India Intrigue (but I was tempted as it reminded me of Benefit's Lollitint) or London Posh (it is too pale for me and has a real golden duochrome shimmer effect, which I wasn't keen on). 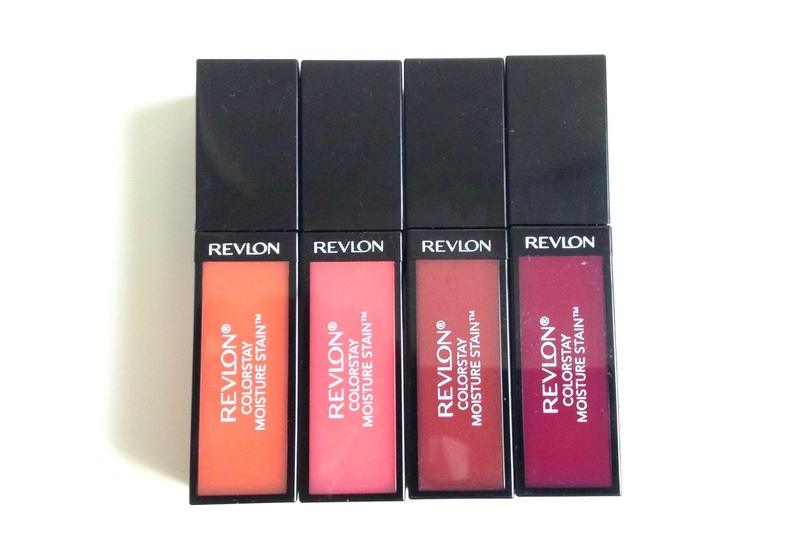 The Revlon Colorstay Moisture Stains are packaged in smart rectangular bottles which show the colour of the product inside - very handy when searching for something in a hurry. The lid unscrews and has a doe-foot applicator wand attached. I don't really wear lip gloss but I do love liquid lipstick and this is a real trend for new releases. I get very excited by them all starting from the original YSL Glossy Stains then the L'Oreal Glamshine Stain Splash (still think this a daft name!) 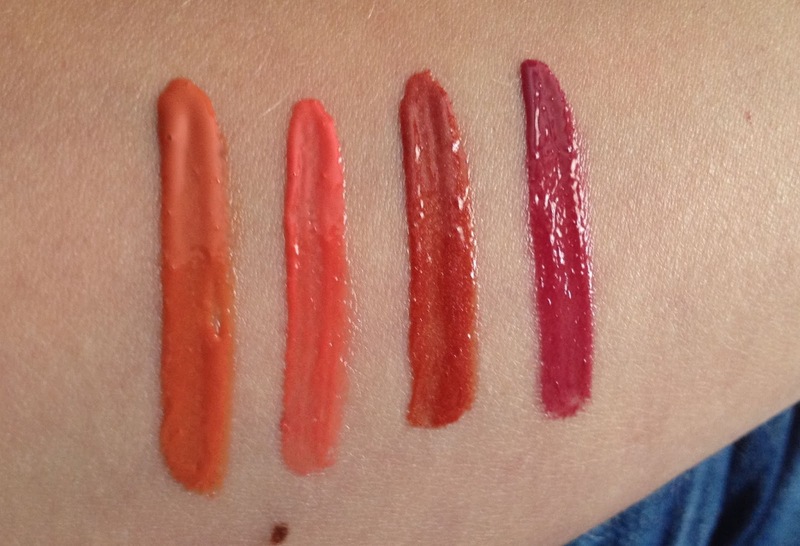 and followed with the L'Oreal Extraordinaire Liquid Lipsticks (which I reviewed HERE). Recently I have been experimenting with the YSL Baby doll Kiss & Blush matte liquid lipsticks (review coming soon!) and of the course the popular Bourjois Rouge Velvet Matte lipsticks. I am also wondering if/when the Maybelline Color Elixirs will make an appearance in the UK? 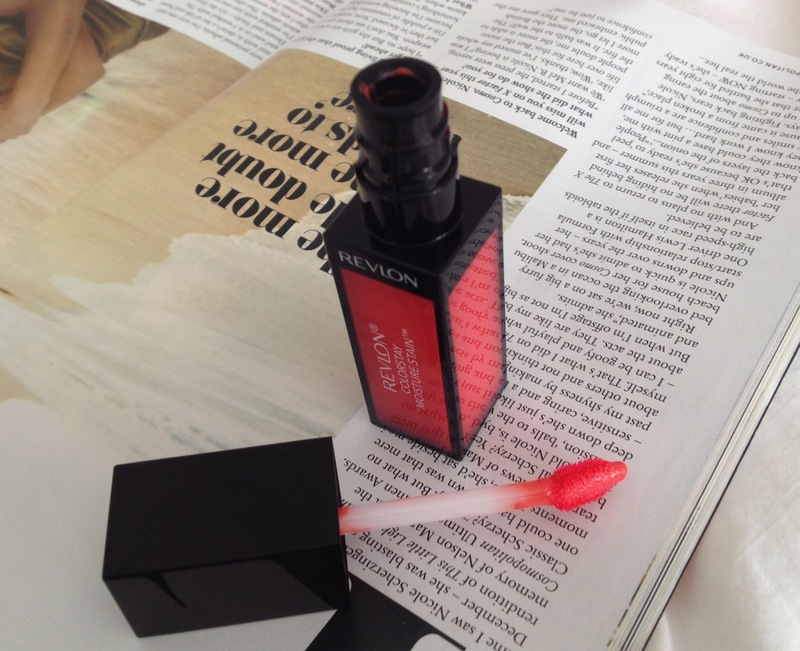 The Revlon Colorstay Moisture Stains apply well with the wand, they really only need one coat although you can make the colour more intense if you layer up a bit. They aren't streaky and settle nicely on the lips. I also didn't detect any real smell or taste in case that kind of thing bothers you. On the lips the feel is quite silky and moisturising but not sticky, it feels more like a balm. After a minute or so it seems to set a little to minimise colour transfer. They are called a stain but I don't think the stain is as powerful as the Revlon Colorburst Balm Stain Crayons or the YSL Glossy Stains. When I wiped the swatches off of my hands there wasn't much of a stain left behind. Personally this doesn't bother me as you only need a feint stain to linger, a heavy stain can be annoying if you change your mind about your lip colour or want to change your make up in a hurry. I am really pleased with the colours that I chose. 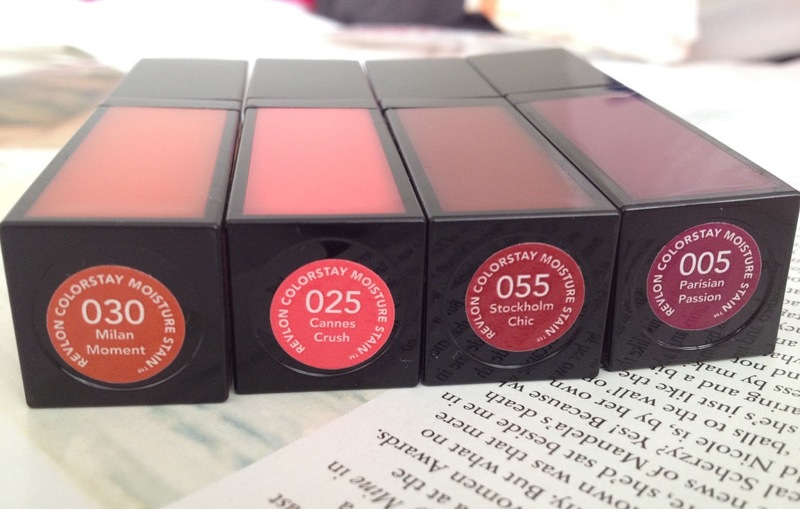 Milan Moment is very me - a summery peach, Cannes Crush is a brighter peachy Coral that reminds me of summer holidays. The other two shades I chose with autumn in mind. Both are darker bolder shades and Stockholm Chic will be a lovely colour and suitable for work, but I will reserve Parisian Passion for evenings (think Rimmel Kate Moss in 107). I am really glad that I finally got my hands on these and no doubt will be giving them all lots of outings over the next few weeks! 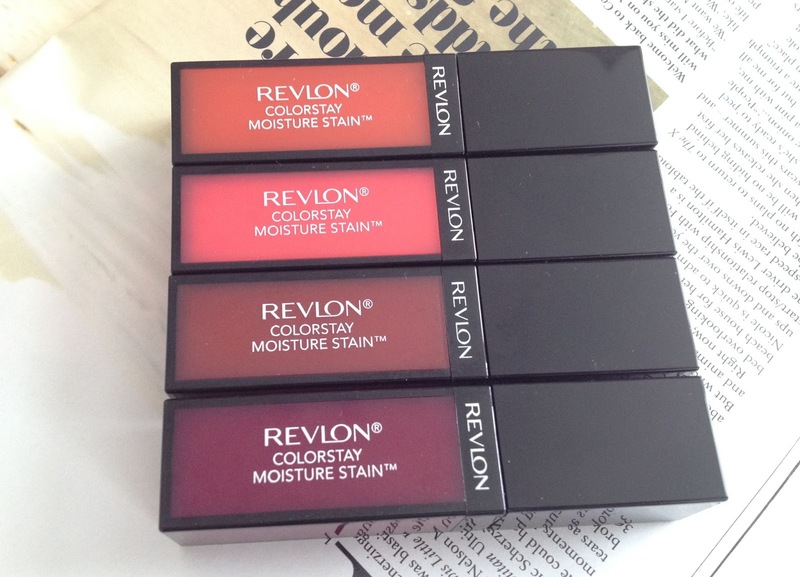 The Revlon Colorstay Moisture Stains are usually £7.99 but are currently in a 2 for £10 Revlon-wide offer in Boots HERE. Thanks - they are good. Definitely give them a try! I like them - let me know if you try them!